1 aXbo for 2 people. With aXbo 2 people can be woken up independently of each other. 2 wrist bands - 2 sensors. Just a tiny acoustic signal is enough to wake you up in your optimal wake-up phase, without disturbing your partner. This *NEW* feature enables you to set a different alarm time for every single day and therefor also means that you can set the alarm to OFF on certain days, e.g. at the weekend. World premiere of an intelligent snooze feature. iSnooze* wakes you again in your next optimal sleep phase, within the next half-hour. With this *NEW* feature you can choose between either a 30 or 15 minute window. Pleasant sounds which help you to relax (e.g. the sound of the sea) fade out automatically as soon as you have fallen asleep. New sounds* can be uploaded at any time. Refuel your energy during the day. Even after just a short afternoon nap you can wake up at the optimal time. With this free software and the supplied USB-cable you can upload new features to your aXbo. The system requirements can be found on our software page. 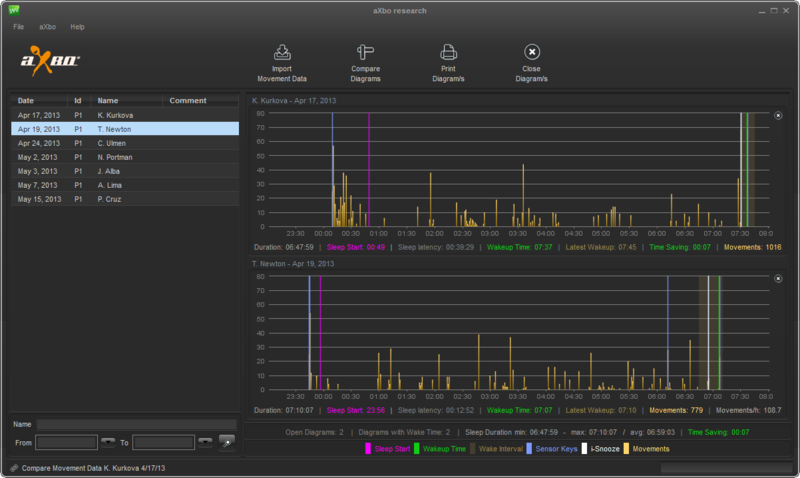 The aXbo research software allows you to evaluate and understand your sleep behaviour on your computer*. Developer can find an "open" version of aXbo Research to be able to program new data analysis features, other designs or a connection to "3rd party devices". **...the system requirements can ce found on our software page.